(TibetanReview.net, Oct08, 2017) – After forcing Tibetan nomads in at least two counties of Yulshul (Yushu) Prefecture of Qinghai Province to give up their pastoral way of life by forcing them to live in fixed settlements where homes were built for them some years ago, China is now demolishing those homes without any information about compensating them, reported the Tibetan Service of Radio Free Asia (Washington) Oct 6. 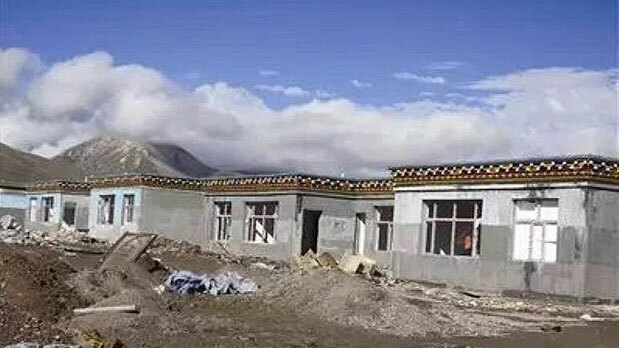 The report said the Tibetans were evicted from their homes to make way for new development projects which include residences for Chinese officials and tourism complexes. Now living in temporary tent settlements with no means of livelihood, many have taken to begging in nearby townships for their survival, the report said. China has previously said Tibetan nomads were being settled down in order to ensure modern living conditions for them, including with education and health facilities. Most of the nomads had resisted the Chinese government move to take them away from the only way of life they had known for generations. Now, however, such resettled Tibetans in a village near Domda Township in Yulshul’s Tridu (Chenduo) County have been ordered to return to their erstwhile nomadic habitat as their resettlement homes were demolished, sources in the area were cited as saying in June this year. To be built over their demolished homes were said to be homes for new Chinese immigrants and tourist hotels. Also, earlier reports said the resettlement sites forcibly vacated outside Yulshul’s Dzatoe (Zeduo) county seat under a policy announced last year was now to be developed as housing for Chinese government workers and tourist accommodations. Erstwhile nomads who still owned some herds of animals were said to have returned to their former nomadic habitats while those without any such stock of animals have taken to live in tent settlements while hoping for some sort of government help.